On July 11th, in collaboration with American Chamber of Commerce, IE Talent & Careers organized IE Women Pass It On: Professional Net Working events on Campus. For this event, we had the honor to have 6 extraordinary women executives from leading multinational companies in Finance, Retailing and Technology sectors, who are also member companies of the AmChamSpain. We kicked off the event with a warm welcome from Alba Vázquez, the Executive Director of IE Women Initiative. She gave us a very detailed introduction about the IE Women Inititave, which is flourished with the work of IE Faculty, researchers, student clubs, alumni and staff, to design the best possible tools to attract and retain women talent, especially in Business, Technology, and Entrepreneurship. IE and Women Initiative’s goal is to inspire confidence and advance women along their pursuit of success. This opening speech was followed by the panel discussion moderated by Dr. Amber Wigmore, the Executive Director, IE Talent & Careers. The panel was comprised by top female executives from Accenture, AIG, Cushman & Wakefield, IBM, Mastercard and Warner Bros. We wouldn’t skip the opportunity of asking their insights about the new trends in the sector that they represented. Technology has been the buzzword during whole the panel discussion. Cristina from Cushman & Wakefield and Rosa from Warner Bros shared their opinions about how technology and ecommerce affected their sector. Both Pilar from Mastercard and Benedetta see fintech as a challenge, but also a unique opportunity for their sector. Pilar mentioned that Mastercard used to be a traditional payment company, but now the data that they generated from their customers is a very interesting resource for government to better plan their city in a smarter way. We closed the panel discussion with Clara from Accenture, she shared some ideas about relevant skills for career development in the competitive corporate world. In her opinion, problem solving and creativity are the most necessary skills. “You should know how to simplify the problem and be able to see problem from another perspective.” said Clara. After the panel discussion, we break out the 6 panelists and the audience into 3 sectorial groups, to continue a more intimate discussion about career development challenges for women directors, challenges in International career development and generational perspectives on work-life balance. 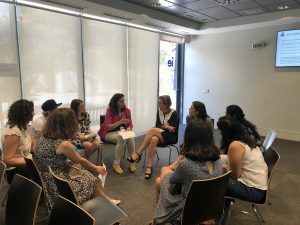 Each of the group discussion were also facilitated by the Key Account Managers from IE Talent & Careers, Andrea Gutierrez, the KAM of Retailing sector, Alessandra Aloisio, the KAM of Technology sector, and Raquel Mediavilla, the KAM of Financial Services. Almost all the 6 women executives that we had were the only female in the board, one of the panelists mentioned, sometimes you have to know how to play your own game. Work life balance and how in order to achieve that having a support system is always important. Guilt will happen but one of the regrets of our panelists was feeling so much guilt. She would try to enjoy it a bit more now. All of them agreed that being practical at work was a really key thing especially when dealing with motherhood. In the end, we would like to give special thanks to Mr. Alejandro Rueda from AmCham Spain for his commitment and kind help of putting together the agenda. We hope to repeat this event again in the upcoming academic year. 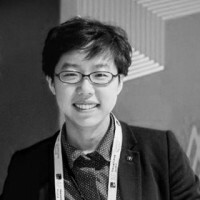 Shuo Xing is the Associate Director of IE Talent & Career department, within the team she is mainly focusing on building effective employer relations with multilateral and development sector. 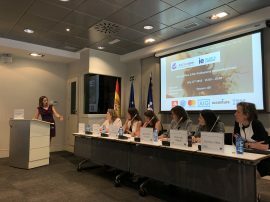 At the same time, she is an active member of the IE Women Initiative and coordinated several women related projects and events during the last two years, such as IE Women´s Day, Oracle4Girls on IE, etc. She holds a Master in International Relations from IE. Before IE, she worked in different diplomatic institutions in Beijing, China.